Amatrol’s ET200PRO PROFINET Pneumatic Learning System (89-EPN1) connects to the PLC Troubleshooting Learning System – Siemens Safety ET200PRO (890-ET200SF) and teaches pneumatic component control via PROFINET and CPX terminals, a family of remote I/O and controllers that specialize in the actuation and control of pneumatic devices, for Safety PLC applications. These vital industrial skills are applied wherever the combination of pneumatics and PLCs are used, such as process control tasks. The 89-EPN1 will benefit operators and maintenance technicians that work with automated lines and pneumatic tasks. The 89-EPN1 includes a pneumatic application panel with CPX terminal and pneumatic valves to teach important PROFINET controlled pneumatic valve topics, such as CPX PROFINET I/O terminal function, CPX-FB33 PROFINET Input / Output (PNIO) module function, MPA pneumatic interface construction, and CPX pneumatic valve module construction. This learning system adds onto the 890-ET200SF to expand Amatrol’s substantial offering of Safety PLC learning systems. The 89-EPN1 includes a variety of industry-standard components laid out on a steel panel for ease of use and identification. Components include a CPX terminal, pressure switch, four limit switches, two pneumatic cylinders, double-acting solenoid valve, and single-acting solenoid valve. A node on the 89-EPN1’s CPX terminal listens for control and configuration data from the controller and then converts this information to output signals; these signals then turn on and off the solenoid valves and operate connected actuators. Learners will use the 89-EPN1’s components to gain hands-on, applicable skills that can be transferred to real-world work environments. Some of these skills include identifying the components of a PROFINET valve terminal, configuring the hardware of a PROFINET CPX terminal, configuring a PROFINET valve terminal in a STEP 7 project, and programming a PROFINET valve terminal. In addition to hands-on skills, Amatrol’s unmatched curriculum provides theoretical knowledge that will reinforce skills and produce a more rounded learner. Important topics include PROFINET CPX terminal hardware configuration, CPX terminal configuration in a STEP 7 project, and PROFINET CPX terminal programming. These topics are laid out in an easy-to-follow format that can be used in a traditional classroom setting or for self-paced learning. 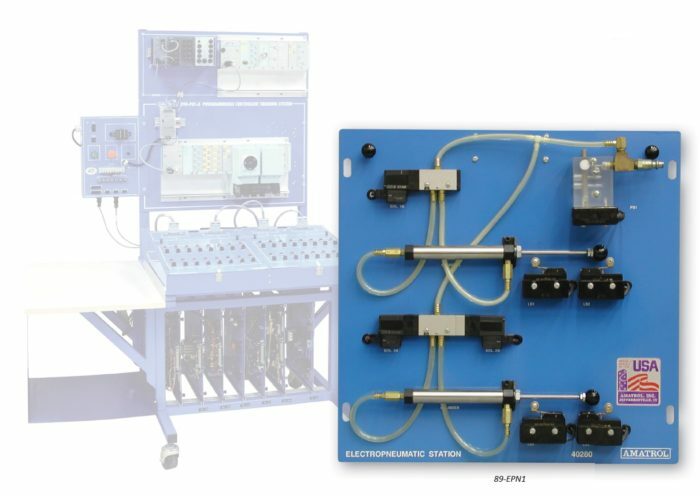 This learning system requires Amatrol’s PLC Troubleshooting Learning System – Siemens ET200Pro – Safety (890-ET200SF), which provides safe operation of a machine or process by improving fault detection and diagnostics in automated systems. Learners will study PLC programming, operation, and troubleshooting for safety PLCs, which enable production to resume quickly following a safety related interruption. Even More Safety PLC Options! In addition to the HMI learning system, the 890-ET200SF features an array of safety PLC learning options. Additional learning systems include: ET200S Stack Light Learning System (89-SLET200), ET200 RFID Learning System (89-RFET200), and ET200PRO PROFINET HMI Learning System (89-HMIET200).